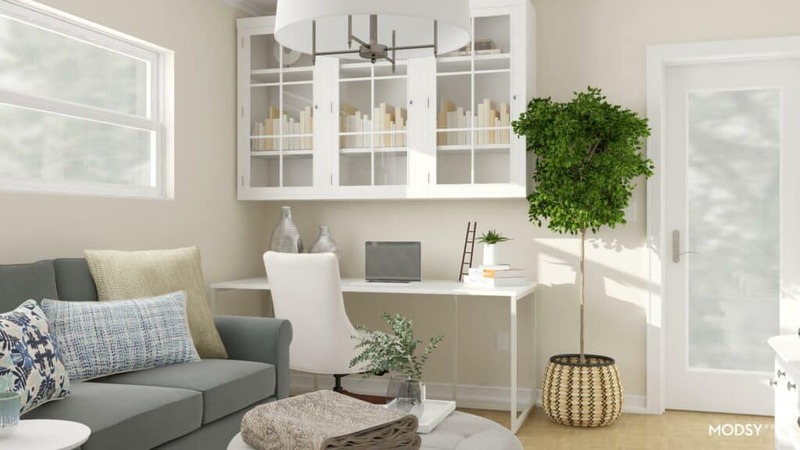 Small home office design can be difficult to tackle. I’m sharing two room plans for a man’s home office and multi functional room with 3D renderings. This post is sponsored by Modsy. All thoughts and photography are my own and are not influenced by Modsy. Thanks for supporting the brands that support this blog. Do you have a room that you just don’t like spending time in, or perhaps even walking into? I do, and thankfully I don’t need to hang out in this room too often. It’s my husband’s home office, workout room and man cave and must serve all of those functions. When we first purchased our home years back this was our master bedroom. It has a tiny ensuite bathroom attached so it’s handy for an office. After putting a large addition on our home shortly after moving in, this became an office. It hasn’t been updated since then and suffers from neglect. 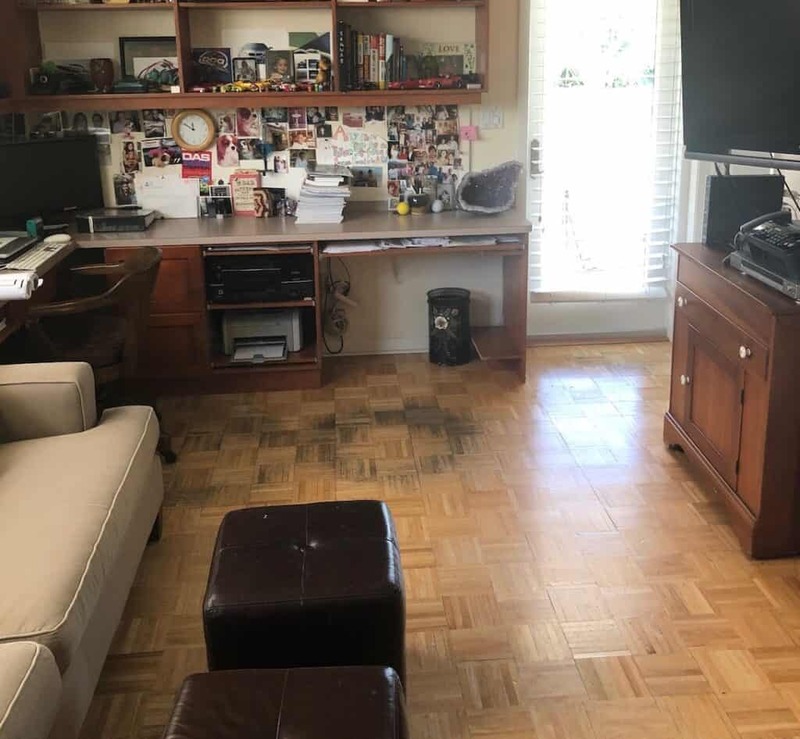 Let’s look at some before photos…shocking, I know! I’ve been taking the initiative to bring our entire home into this century little by little. One of the projects that I hope to do this year is to replace the damaged parquet flooring in the three bedrooms. Before you tell me that I should have the parquet flooring restored, it’s not a worthwhile project in this case. I’m not surprised to learn that hardwood flooring is no longer the most popular choice for some rooms, especially kitchens. Once these floors are replaced, let the small home office design project begin! Let me reiterate that I don’t spend much time in here and it is clean, if nothing else. I do use the treadmill but that’s about it and he doesn’t mind working out of this space one bit (insert – shock face emoji). I had several asks with my Modsy designer and wanted to see if they could assist with one design including the treadmill and one without. The outdated built in storage will be removed, but he still needs storage in the room. 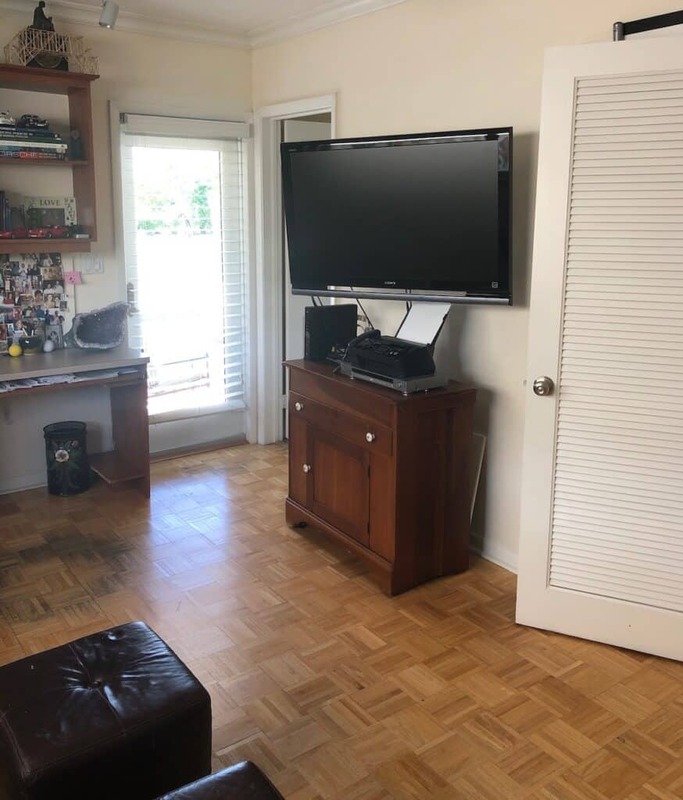 The TV will stay but all of the furniture including the desk needs to be replaced. You may recall that I worked with Modsy on a previous project in a redesign of our master bedroom. 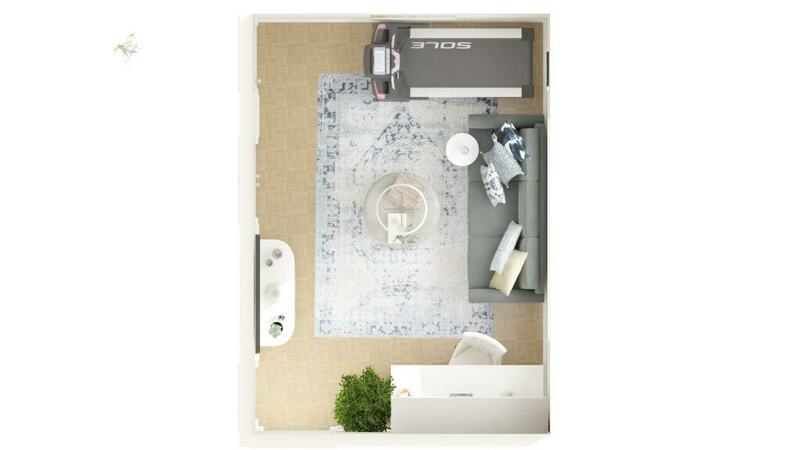 Although I’m no stranger in putting together mood boards, I would be totally stuck at 3D room design. That’s where Modsy comes in and I could not be more pleased with this service! Your Room –Take measurements of your room. Then, using your smartphone you take photos of the room from various angles and upload them to your profile. You DON’T need to clean or empty the room for the photos (which is a good thing;-)) since the designers will be creating the room fresh. 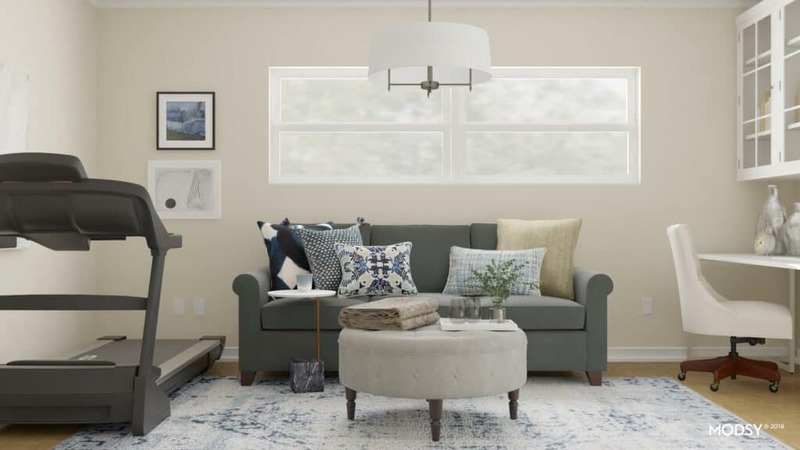 Determining Your Style –Next you take a style quiz and tell the Modsy designers more about your project needs, existing furniture, and budget. The Modsy designer will be using your results in designing your space. 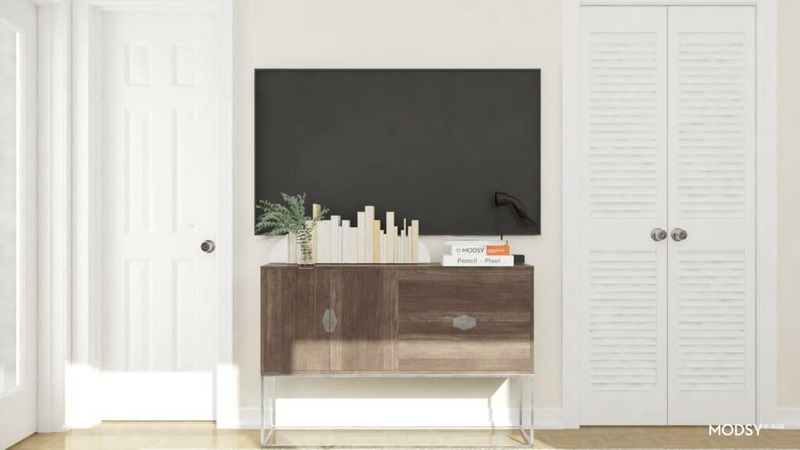 Should you have a specific piece of furniture that you’d like to incorporate, the Modsy designer can do that as well. You will be able to share some of your favorite brands with the team. 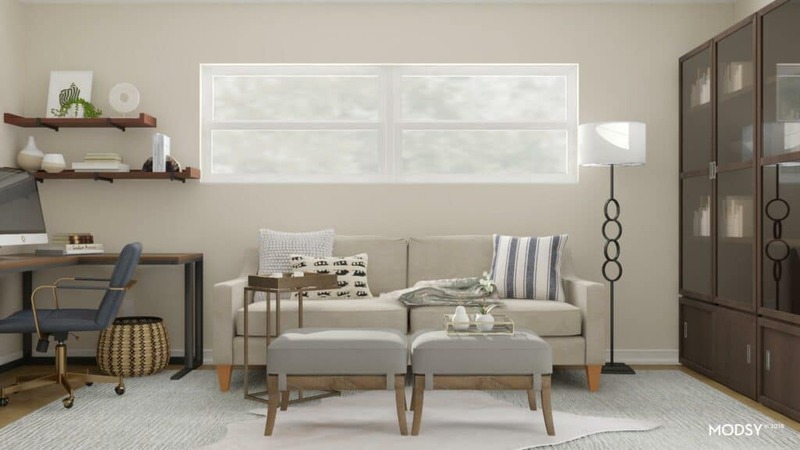 Design Reveal –Modsy Designers create 2 custom design plans (with different layouts and furniture) that fit your style and budget. Seeing everything to scale is so helpful! Fine Tuning –You can with the Modsy design team or the 3D Style Editor to fine tune your designs until they’re just right. Shop From Home – You have the option of shopping directly from your design plans directly through Modsy. They guarantee to find you the lowest price on all your items, plus you can earn discounts when you purchase through Modsy. It’s just like working with any professional interior designer who takes care of ordering logistics. My Modsy designer came up with this design first and nailed it with everything that I asked for! In an ideal world we would like to find another space for the treadmill. We are limited in space in the other rooms so I don’t think that’s an option in this 60’s home. 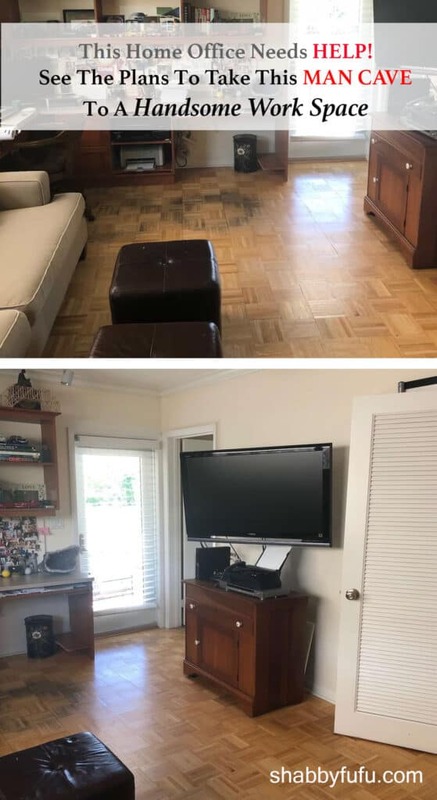 This room serves as a den (man cave) as well and with the tv stand being white, I just may paint the existing one if I chose this design plan. I appreciate how it has that Florida coastal aesthetic that I love! 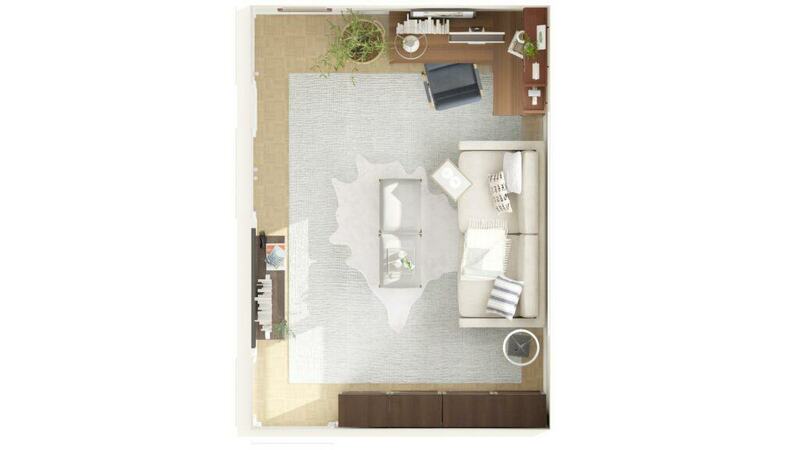 We aren’t quite sure if this room plan would enable enough storage, but it’s a great start. I don’t know why I hadn’t thought of plants in the room, but love the idea. In working with the Modsy design team I asked for an area rug to soften the room. A top priority though was easy care since we have dogs. In my shoppable studio that I’ll share below there is an incredible selection of indoor/outdoor rugs!! While I love the white, grey and blue contemporary design this office IS my husband’s. I asked the Modsy designers for another version both in a masculine style and sans the treadmill. Here is what they came up with in design two. As you can see the layout is much more roomy without the treadmill. On the right hand side is a large storage cabinet with deep tones and modern glass doors. My husband works with blueprints and needs a large desk space, so I’m not sure that this would suffice. No worries as I can go back to my Modsy designer who will shop for me virtually with more suggestions. Another contemporary storage space in deep wood tones that are he prefers. Both of these designs bring this home office up to date and have that clean look with storage to hide clutter. Personally I think that this is the new wave and the future of interior design. It’s real design for real people who are simply looking for some assistance. Modsy is so affordable too! There are 3 different price points on their packages and I highly recommend giving Modsy a try! It’s like having your own personal interior designer at a fraction of the cost. Having an online designer saves a lot of headaches and back and forths. From submitting your chosen room, to receiving the designs, to shopping and delivery logistics, the Modsy team is there to assist. 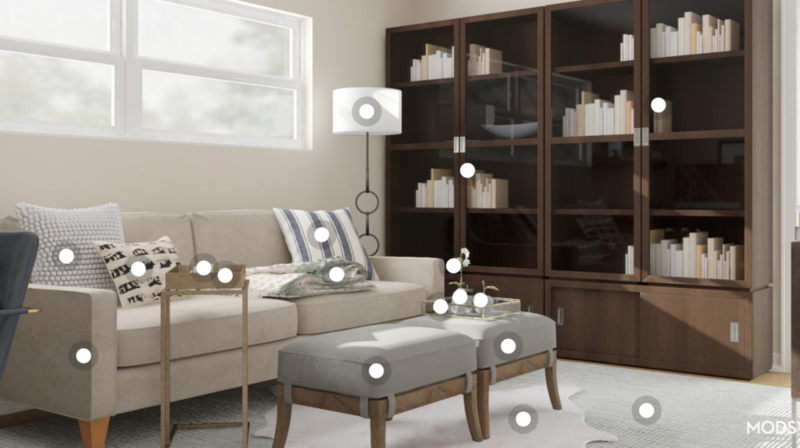 Instead of having to dig and search for what you need, Modsy gives you a virtual selection of furniture and accents. They work within your budget and it’s fun to see how the pieces will work in your room! When you shop through Modsy you’ll receive Modsy’s personalized shopping service along with discounts and the lowest online prices. They have several plans to choose from including BASIC, CLASSIC, PREMIUM and even MULTI ROOM. Wouldn’t it be fun designing your entire apartment or home with Modsy?! I’m offering you a 20% off coupon code to use on any design package (except basic)!! If you are ready to get started or simply curious…visit MODSY here and use my DISCOUNT CODE: JANET20. What are your thoughts? Is this something that you’d be trying out to help with design in your home? Pin it below for inspiration! I love that there is a place you can go to get help with designing. All of the choices for that room are gorgeous! The choices are amazing. I wish I had a space like this in my house that I could go to for work! Wow! I’ve never heard of Modsy before and I love both home office designs. I can see how your husband would prefer the second one but I’m crazy about the first one. Love both of the ideas. There are a few ideas I think I could incorporate into my spaces. Hubby would probably like the first one the best but for me I’m going with the second one. Love them both. Functional, comfortable and they look wonderful. The second one looks more masculine, but I think the first is more in keeping with your style. Both look great. I like the second plan best but if I were working there, I’d like to have the desk turned around facing the center of the room with my back to the corner. Hmmm……..
Never heard of this service before! I am so excited to try it our for our multi functional “office”. We also will need to work around certain items. Love both of the ideas they came up with for you. Please post pictures of the end result! How nice! I like the choices. We don’t have room for an office in the house so I just do everything from the couch in the living room. Those ideas look so good! I could use a new update on my office space. 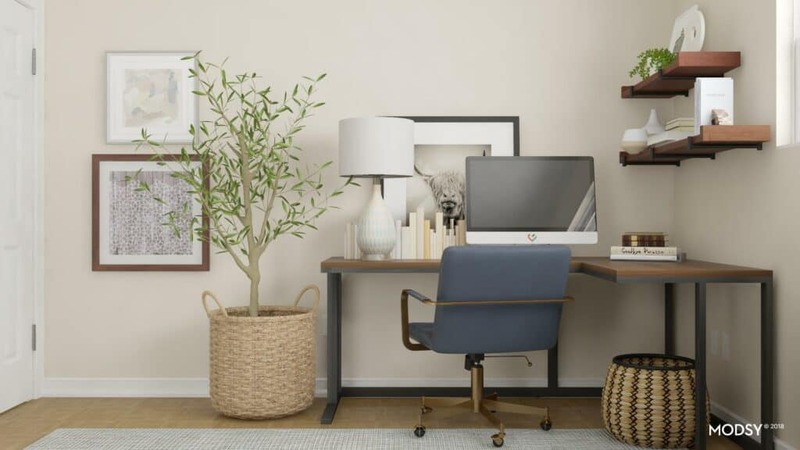 It is literally just a desk and I would love to have it look a little bit more like an office. I really like a lot of these ideas. Thank you so much for all the great inspiration here. My office needs some serious TLC, but I’ve been a little overwhelmed as to what to do with it. Wow, this is such a nice service. I’m definitely keeping it in mind that next time we decide to take on a room. We are thinking of updating the basement and Modsy would be great for this project. I have never heard of MODSY before now but I love the idea of this. How perfect for redoing various rooms in the house especially offices. I need to investigate this and see how I could potentially redo my younger daughter’s room soon. It’s on my list of thing to tackle. ive never heard of this before but i def want to take a closer look at it for some rooms i want to redo it in our new home! Both designs are lovely but a bit feminine. I think the green sofa is a good neutral color to work with. What about barn doors to replace the closet doors? Don’t worry about the treadmill!! it is a very nice one:). Good luck and thanks for sharing about Modsy…never heard of them. I love Modsy, so cool to get to see it in advance!! What an amazing service!! So glad to hear and read about it. How will you choose?!?! Where the heck have I been. I did not know this kind of service even existed! I might check them out for my son’s room update I have been thinking about doing for the last 3 years! Oh, and I love the light and bright 1st option! It just seems like Florida to me! Wow, very nice redo. I love all white. My house is slowly turning to all white with a splash of brown wood. I have a treadmill also. Hard to decorate around it but it stays no matter what.. More important than furniture.. USE it. I would love if the desk didnt face the wall.. I would like to look out at the room, is that possible? Which did your hubby like? Mine has to stay too Gail since I cannot seem to find another room for it. 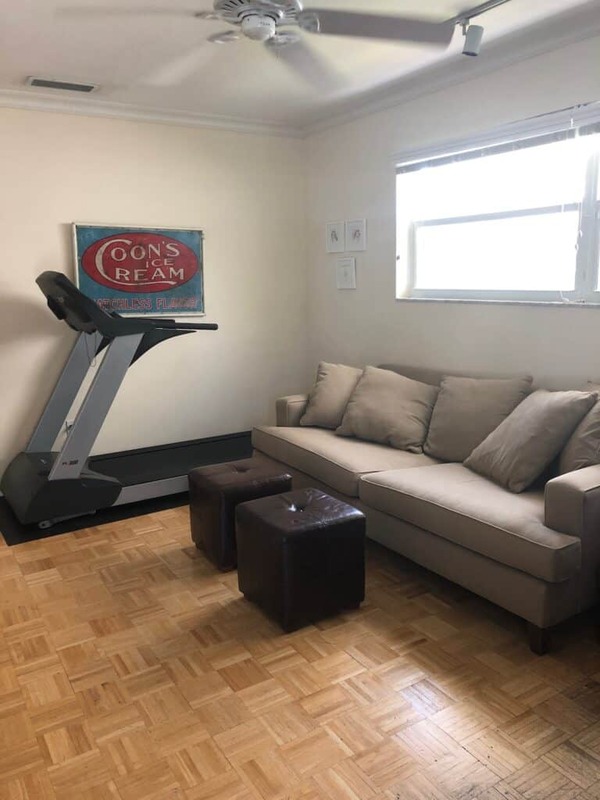 The way the room is a desk facing the room would face the treadmill, so that wouldn’t work. He likes the more masculine look and not the white. Love the first one for office. 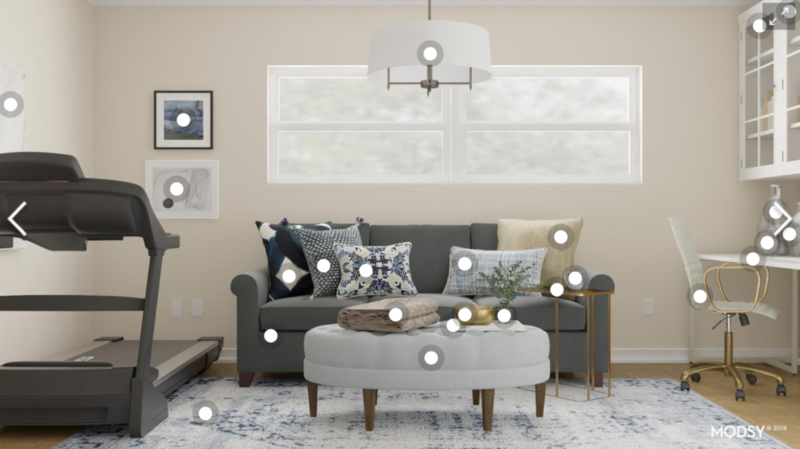 I used Modsy and they were helpful for my family room.. This sounds like an amazing service! We’re looking to remodel our master bathroom, but we’re stuck on a few decisions. I bet Modsy could help! I love all of the design elements of this home office. It’s really functional and the color scheme is awesome. What a wonderful service! Thank you so much for sharing and these designs look fantastic! I have seen a lot of people using Modsy lately! I think that is such a great idea to give you ideas of what to do with a space! I really struggle sometimes with designing my home the way I want. It sounds like Modsy would be a perfect service for me. Janet, this is such a timely post! I will be bookmarking it to use soon. 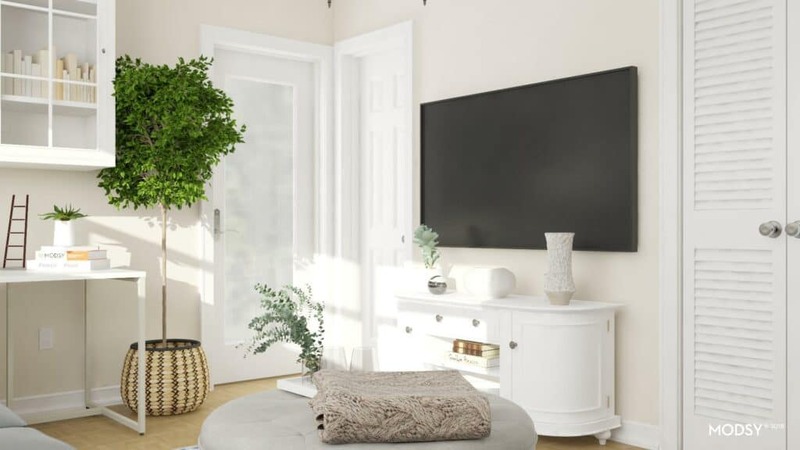 As soon as our family room is finished I will finally get my living room back and it has always stumped me as to how to furnish it, since it has lots of doorways and little wall space! This is such a fabulous and super affordable service! Seriously even if this wasn’t a sponsored post I would use it. My favorite room to decorate was my home office. There are so many great options! What a great tool Janet. They have really given you great options. The first plan would be your room and the second one is a bit more in keeping with a masculine style. Both really great plans. I love Modsy and how affordable the service is compared to hiring an interior designer locally! I love all the white in the #1 design and it would go with your home. But, it’s his office, the white desk probably wouldn’t work for your husband and would show wear quickly. Maybe you could do a driftwood looking desk and the white tv console. I would definitely go with the lighter sofa though to keep the space bright. Keep the treadmill. I have mine in my quilting room. Good luck Janet, I know you will do a beautiful job redecorating this room. 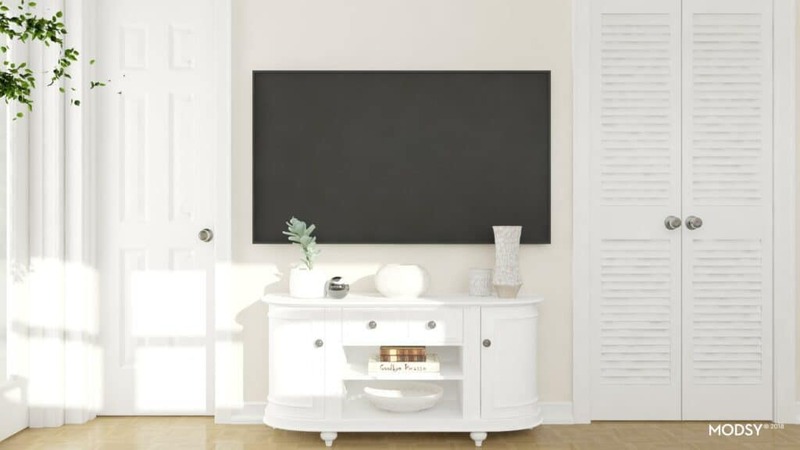 Janet, I love the white furniture in design #1 and it would go with your home. But, it’s your husbands office. Why not do a desk in a driftwood look and combine it with the white tv console. I also think the lighter sofa would be nice to keep everything bright. Keep the treadmill. I have mine in my quilt room. Good luck Janet, whatever you decide it will look fabulous. Thank you Sharon…I think that if anything, we will combine looks. Need to get some new flooring in the room first! Both of these designs are great! We are thinking about turning our dining room into the family room and vice versa. If we pursue the idea, we might need to have Modsy help us figure out the designs. It’s a great service and really allows you to see your home from other eyes at a reasonable cost. Yes, Lani helped me fix the crazy Gravatar issue! My office is very dark and I would love to lighten it up. I have a friend who does furniture make overs. I should have her do mine! I love the color you’ve chosen for the room. I am not good in design so Modsy will be a great help. Oh my! I think I just found something incredible fun to help with designing my spaces in the future. This helps you get the perfect image of what could be. The design you completed in modsy was great. I like the first one, but your hubby would probably like the second. I had the same thought as Linda Walton—-a wooden kitchen island with casters on it. Wow, you have some great ideas. I think the man cave will turn out to be absolutely gorgeous. I’ll check them out, I’m doing some updates. Your husband’s “before” looks much better than my husband’s office/man cave. It is dark and cluttered and horrible and I’m not allowed to touch it. 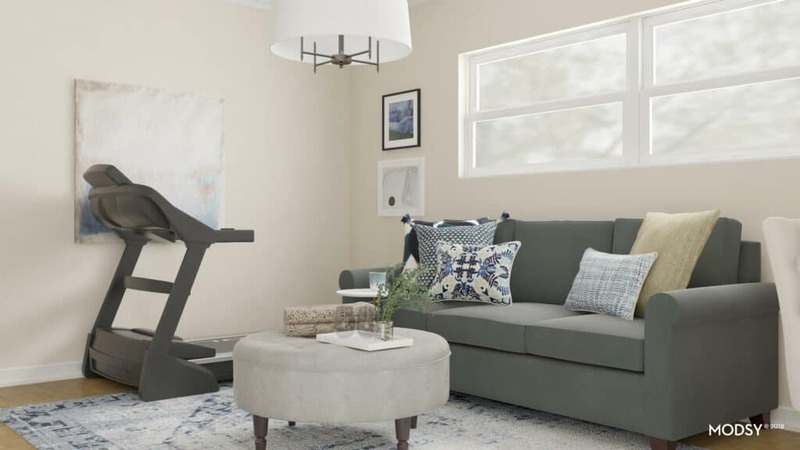 Both of the suggested plans look wonderful and either will give him a beautiful bright space in which to work, workout or watch TV. I am hoping that someday I can wear down my husband’s resistance to doing anything to improve the look of his home office. Hi Carole! My husband is VERY resistant to change in his home office as well. 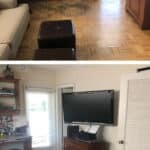 We do need to replace the damaged flooring and then repaint. With everything coming out of the room for that I think it will help the transition. Maybe you can suggest a fresh coat of paint and go from there?